I opened my Facebook yesterday morning and was saddened to see Chia Suan Chong’s post about the passing of Dave Willis. I went over to Twitter and the feed was already filled with RIPs and condolences. 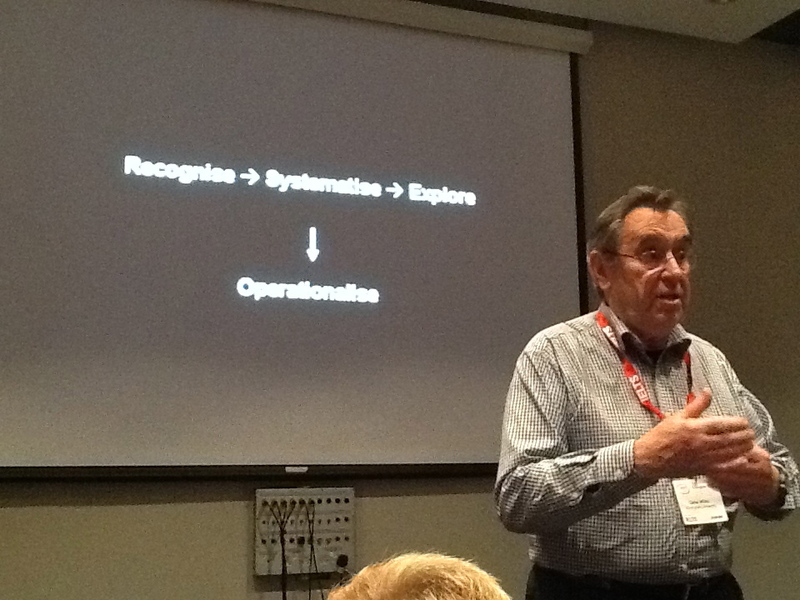 For most in the ELT world Dave Willis’s name is associated with Task-Based Learning. But his contribution to lexical approaches to language teaching is just as outstanding. In fact, his pioneering work on the first Lexical Syllabus predates Michael Lewis’s seminal book by three years, the main difference between the two being words as a starting point for Willis and collocations for Lewis. In the late 1980s Collins published a new EFL textbook co-authored by Dave Willis and his wife Jane. The book was an outcome of the COBUILD (Collins Birmingham University International Database) project – at that time the biggest and most significant attempt to compile a corpus of contemporary English. Simply titled Collins Cobuild English Course, the book was based on a very simple premise: most common words in English, such as do, get, it, way carry most important patterns in the language. When I was in charge of the book stock and teachers’ resource room at the British Council I was lucky to stumble across two dusty copies of the student’s books- Level 1 and 2 – and “save” them when the teaching centre closed down. Looking at the coursebook now, more than 20 years after it was published, one can see why the ambitious series wasn't the runaway success it should have been. Authentic unscripted dialogues full of false starts and pauses, interspersed with erms and mhms with native speakers interrupting each other while engaging in various tasks was too radical a departure from the conventional coursebook format. Add to that things like “At eight o’clock I’m just leaving my house”, “At one o’clock I am normally eating my lunch” (Oh horror! It should be Present Simple!) and the conspicuous absence of traditional grammar labels would surely appear outlandish, if not bizarre, to an ELT practitioner at that time. Mind you, it was the time when the Present Perfect didn’t appear until Unit 6 of the Intermediate level and the texts were carefully vetted to make sure an “unknown” structure hadn’t slipped in to distract the learner’s attention from a specific grammar point being expounded. A couple of years later, Willis published a book about the book. The Lexical Syllabus (1990), which is a must read and re-read for any English teacher, was basically about the process of writing the coursebook. Willis describes the rationale behind the groundbreaking coursebook and explains why they chose to focus on 700 most common words – fresh corpus evidence had just come in that these 700 words constitute 70% of English text. The fact that such a small number of words accounts for a very high proportion of English text “shows the enormous power of the common words of English”, states Willis (1990: 46). Using these as a starting point and doing away with the grammar syllabus, the Willis's English Course still covered all the “traditional” grammar points (Present Simple, Conditionals, Modal verbs) and then some. It also highlighted many features of spoken grammar which were absent from textbooks around that time, for example “that” for pointing back (So we did that one first. That was the easy one), “as” for when/while (Chris draws a rough map as Philip talks), such patterns as “go and…” (Shall we go and see a film? ), “to do with” (Anything to do with sport) etc. And I hope it wouldn’t be speaking out of turn to say that the idea behind the coursebook was what inspired Scott Thornbury’s Natural Grammar which was built around a similar principle: focusing on the "small words" of English and highlighting patterns associated with them. In his IATEFL Harrogate 2010 talk What do we mean by 'grammar''?, which I was lucky to listen to live (I also enjoyed a nice chat with Dave at a reception that evening), he insightfully noted that we spend an awful lot of time on teaching “easy” aspects of grammar and largely leave the learner to work out truly difficult bits by themselves. As an example he gave multi-part verbs which can be separable (look smth up or look up smth) or inseparable (look after smb) - a real minefield for a teacher! Interestingly, students somehow pick them up without our involvement – have you ever heard a student say “look somebody after”? So can we really claim that we teach grammar if all we do is select the easy bits – and spend on them an unproportional amount of class time - while casually avoiding truly complicated areas? It is for insights like this, his criticism of the grammatical syllabus and innovative approach to language teaching that I consider Willis a lexical pioneer to whom we owe a debt of gratitude. I, like you Leo, was genuinely saddened to hear the news of Dave Willis' passing. Having never met the man, I didn't feel it was my place to write a piece such as this. Nevertheless, having been so profoundly influenced by his great work in my own career, I'm so glad that you have been able to put into words how I and countless others felt about this great man. Thank you for your comment, Adam. I am glad I am not the only one who has been influenced by his work and moved by his death. Thanks for posting this "tribute", Leo. I was very sorry to hear about the passing of Dave Willis. I’ll never forget all the knowledge I've gained through his works and how it affected and shaped the teacher I am today. I know that nothing anyone can say will take away the pain of this loss. Thank you, Dave! What saddens me also is I don't know how many teachers can say what you said about the influence his work has had on you. Dave Willis was not only an original thinker, a great teacher, a lucid writer, a consummate scholar, but also a warm and generous human being. I for one will miss him enormously, and I'm grateful, Leo, that you have so promptly and concisely celebrated his achievement. I was really moved and I felt I had to write something to honour the man. I am sure many more blog posts and articles will follow to celebrate his achievement. Thank you for stopping by and leaving a comment, Scott. It's very very sad news. I have many fond memories of being with him at conferences in East Asia, setting up the Birmingham MA courses in Japan together, and much more . . . He was always full of inspiring ideas and so supportive towards others. I hope that his immense contributions to ELT continue to get the recognition they deserve. Thank you for your comment, David. It seems like you knew each other much more closely. Unfortunately my encounters with Dave were limited to occasional meetings at IATEFL conferences where I've always tried not to miss his talks. Hi, Leo! Thanks for this tribute post to Dave Willis. He is indeed a great loss to the TEFL world. His contribution to our teaching is indeed immense. His influence however will never die. So sad to hear of Mr. Willis' passing! Thankyou for your wonderful tribute! Thank you for your comment, Becky. Please accept my condolences! It's a sad thing to know that mr. Willis had passed away. I do owe him his bright ideas about lexical phrases, TBLT, and the like. I think we all do, Ronaldi.